Since I was confirmed as Army secretary in May, I’ve tried to get out of the Pentagon and see America’s Army through the eyes of soldiers doing what they do, where they do it. I’ve engaged with teams of soldiers in exercises with our NATO allies in Poland. I’ve watched them conduct jungle warfare training in the Pacific, and participate in northern warfare training in Alaska. I’ve marveled at the ability of our Army—from our youngest soldiers to our most senior leaders—to engage with partner militaries from Malaysia to Jordan, and to train and mentor national armies fighting for their future in Iraq and Afghanistan. I’ve even seen Army athletes compete for Olympic glory. They included 2nd Lt. Sam Kendricks, a son of Mississippi and a bronze medalist in the pole vault, who humbled us all as he paused in midcompetition to pay respect to our national anthem. I watched as Spc. Paul Chelimo, a Kenyan-born soldier who earned his U.S. citizenship through Army service, won a silver medal in the men’s 5,000-meter race in Rio de Janeiro. These are just a few of our soldiers’ remarkable accomplishments as they confront the diverse missions that America has entrusted to its Army—missions that will grow more challenging in an increasingly complex world. Accomplishing these missions today and into the future requires our force to include the broadest possible spectrum of ideas, perspectives and experiences. 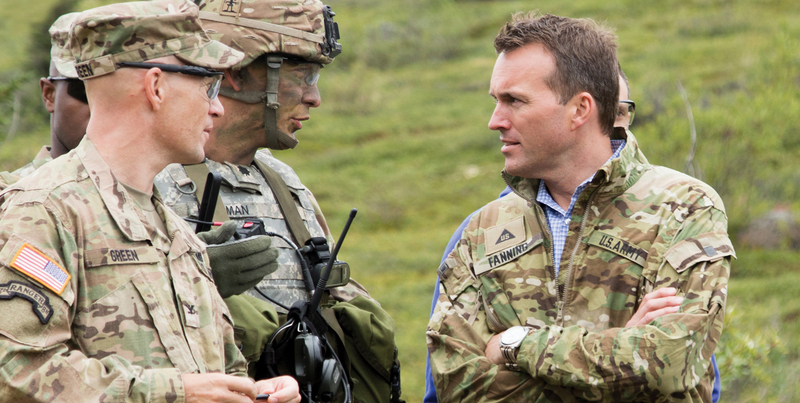 Army Secretary Eric K. Fanning meets with members of the 25th Infantry Division at Joint Base Elmendorf-Richardson, Alaska. Soldiers attend the live-fire portion of a munition class at Grafenwoehr Training Area, Germany. To fight and win the nation’s wars in an age of new and emerging threats, we need to draw from America’s best and enable them to harness the innate power of diverse teams. We need experience, critical thinking and creativity in our force but most importantly, we need teams of people who think differently from one another and yet are joined together in common cause. More than 30 years of scientific and organizational research clearly demonstrates that cognitively diverse teams are better at solving complex problems when compared to more homogenous teams, even when the homogenous teams are composed of top-performing, highly capable individuals. We know some of this instinctively: Different approaches often reveal overlooked solutions. Solving a problem often requires learning from others how to see it differently. Researchers at the California Institute of Technology and the University of Michigan found teams that include members of different ethnic or cultural backgrounds bring a mix of distinct cognitive approaches, delivering better outcomes. Business schools teach similar lessons based on their own research on gender. Their findings demonstrate that stronger and more effective firms include greater numbers of women at top levels of management. Other studies have documented how teams of individuals drawn from diverse economic backgrounds, academic disciplines and political affiliations are better problem-solvers and drivers of innovation. Within the Army itself, civilian contributions have been particularly pronounced in this area. Diverse teams enabled our scientists to develop the lithium battery and night vision and, most recently, work toward a vaccine for the Zika virus. Today, within organizations such as the Defense Advanced Research Projects Agency, civilians and soldiers partner to keep our Army at the cutting edge of developments in robotics and materials science. As an Army, we need to do more to recognize the remarkable value that civilians bring to our total force, which comes in part from the different perspectives they bring to our problem sets. Within diverse teams, problem-solving is additive; it is not simply that one member proposes a novel solution. Rather, each new solution influences and can be built upon by another team member, generating a virtuous cycle of beneficial outcomes. No single member of the team could generate the ongoing series of improvements to that solution. It is a combination of teamwork, ability and diversity that produces the greatest benefit. New York Army National Guard soldiers with the 369th Sustainment Brigade train at Fort Indiantown Gap, Pa., ahead of deploying to Kuwait. Scientists have long taken advantage of this dynamic, adopting interdisciplinary approaches and incorporating insights from different fields to help solve otherwise intractable problems. This approach to innovation led to the discovery of the double helix, the invention of the microwave and other breakthroughs. So the verdict is in. 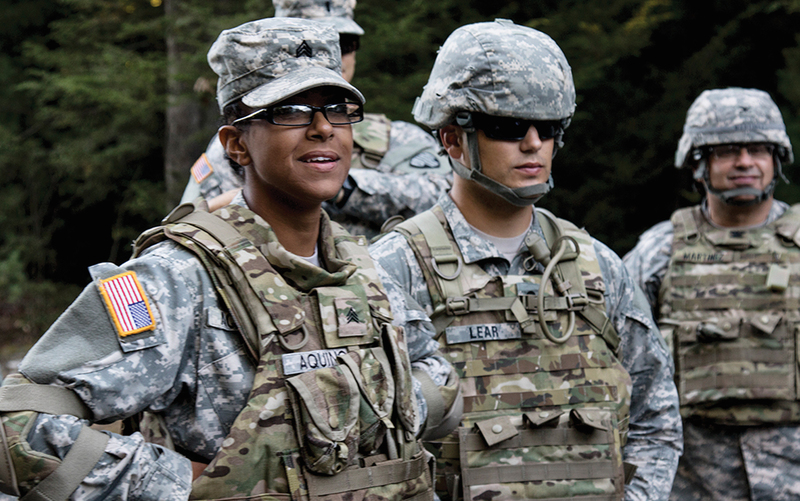 For the Army of tomorrow to be as strong as the Army of today, we must harness the power of diverse teams and draw further from one of America’s greatest advantages: our diverse population. It’s a lesson the Army has lived many times across its history. But our success is never static. We must challenge ourselves to harness these benefits and make the force more effective. The Army must draw from a broader range of our nation’s communities and expand the pool of eligible and willing candidates for service and leadership, enabling the Army the greatest opportunity to recruit and retain America’s best. Efforts to engender a broader spectrum of ideas and perspectives within our Army team are also complemented by DoD-wide Force of the Future initiatives. At the heart of Force of the Future is a push to break down walls between the military and one of our nation’s greatest sources of strength, our innovative industrial base. By providing more opportunities for skilled experts in areas such as cyberspace operations and electronic warfare to contribute to our team, and by allowing more of our soldiers to gain insights and experience from working in the private sector, we will make the Army a more effective force for the future. Few other nations have so many diverse communities and perspectives woven into their social fabric or history. But engendering greater diversity is not simply a matter of tapping into larger numbers of communities. It also requires us to attract greater numbers of future soldiers from different regions of the country such as the Pacific Northwest, West Coast, Southwest and Northeast. They contain many of the healthiest and fittest cities in America as well as increasingly diverse populations that mirror America’s changing demographics. A crucial benefit of a more diverse Army is that it allows us to narrow the civil-military divide at home. Today, too many of America’s communities are unfamiliar with their Army, even though these communities include men and women whose skills and abilities would make our Army team stronger. We must ensure that when Americans from across society look at their Army, they see an organization they can relate to, recognize and trust. We must also ensure that when America’s best and brightest look at their Army, they see an organization where they feel they can contribute and excel. Finally, a more diverse Army provides the United States with a competitive advantage in expanding our ability to interact and engage the citizens of the complex world in which we will continue to operate. This is absolutely critical, because no other arm of our government has such a large presence around the globe as the U.S. Army does. For example, while approximately 15,000 Foreign Service officers are at work around the world representing our nation’s interests, America’s Army has up to 10 times that number of soldiers at work overseas every day. Today’s Army is unique in history in that we have at least a few soldiers in our ranks from virtually every one of the countries and cultures in which we currently operate. How much more effective could we be at partnership and cooperation if those few became many? In addition to the benefits that diverse teams create in strengthening partnerships, nearly two decades of conflict have taught us hard truths about how appreciation of diverse populations helps equip us in understanding and defeating our adversaries. When the Army is tasked not only to take and hold terrain but also to bring disparate partners together—many of whom have difficult ethnic and sectarian histories—the diversity of our teams is also a force multiplier. 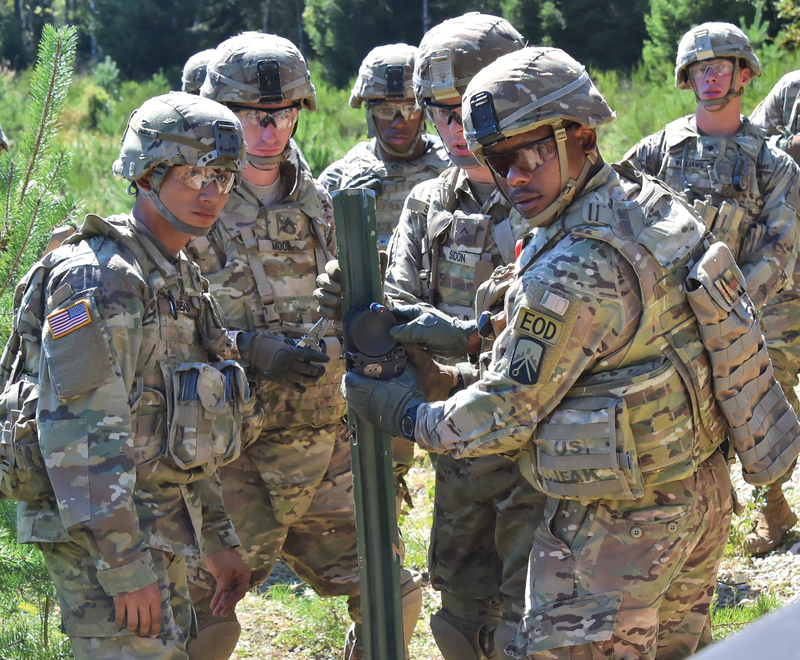 Partners across the world like to work with American soldiers and when they do, they cannot ignore the diversity of soldiers or the standard of excellence they set in working together. Our Army draws strength from both the example of our power and the power of our example. For the Army to measure up to the demands of a rapidly changing world, we must also draw on the Army ethos of critical thinking and self-examination. It may be underappreciated outside the national security community but no organization, public or private, matches the Army for its culture of relentless self-review that is borne from the experience of ground combat, where mistakes are measured in lives. We need to draw upon this tradition to challenge our own notions of diversity and examine our unconscious biases. We often pride ourselves in embodying the word “meritocracy”—that we are an institution in which any individual can succeed, or fail, on his or her own merits regardless of race, color, national origin, religion, gender or sexual orientation. The many instances where we have approached this ideal are part of our Army’s great strength, but honoring these ideals means that we cannot afford to ignore the times where we’ve failed to live up to them. Striving to engender greater diversity in our force is too important to the Army’s effectiveness to avoid continuous self-examination. Whether during World War II or in the days that followed Sept. 11, it is when Americans have come together in times of difficulty that our nation has demonstrated its greatest strength. And at so many times in our history, the Army has led the way. Arizona Army National Guard Sgt. 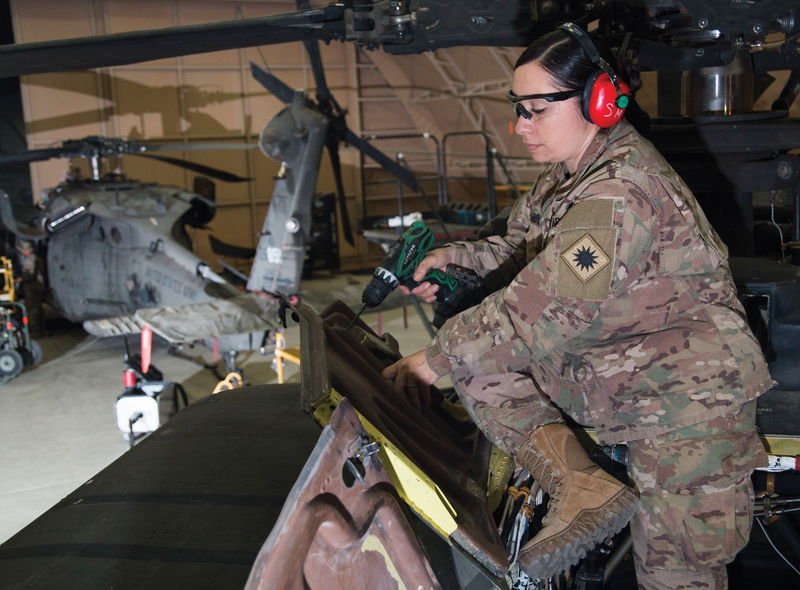 Cynthia Hernandez works on an Apache helicopter at Camp Buehring, Kuwait. Engendering greater diversity and inclusivity is not social experimentation; it is, in fact, a dynamic that has often been at the center of the Army’s success. It’s a story that dates back to the earliest days of our republic, when marginalized Scotch-Irish frontiersmen teamed up with Tidewater aristocrats and New England merchants to win our independence. It’s a tradition carried forward by waves of immigrants who came to our shores and forged their American identity through military service. It’s a legacy found in the service of the famed Buffalo Soldiers, African-American troops who helped tame the American West. Many of them were former slaves including Lt. Henry Flipper, the first African-American to graduate from the U.S. Military Academy. It’s a history that includes soldiers such as Distinguished Service Cross recipient Pvt. Marcelino Serna, a Mexican-American who was the most highly decorated soldier from Texas in World War I. These examples are each part of our larger Army story. When critics said the Army was too set in its ways, too big or too afraid to move forward with change, our men and women in uniform proved them wrong: desegregating after World War II, 16 years before the Civil Rights Act; and integrating women into the military, where they would earn pay equal to their male counterparts’ pay, four decades ago at a time before they were welcomed in much of the U.S. workforce. As the Army answered challenges and delivered solutions at difficult times in history, our soldiers have proven what’s right about our country. To do justice to Carney’s dedicated service and the sacrifice of countless other Americans, we have responsibilities to meet today. We must continue on our journey, building stronger and more diverse teams that will make our Army a more effective force in the future. From left, Spc. Terrance Curry, Sgt. Lictor Figueroa and Pfc. 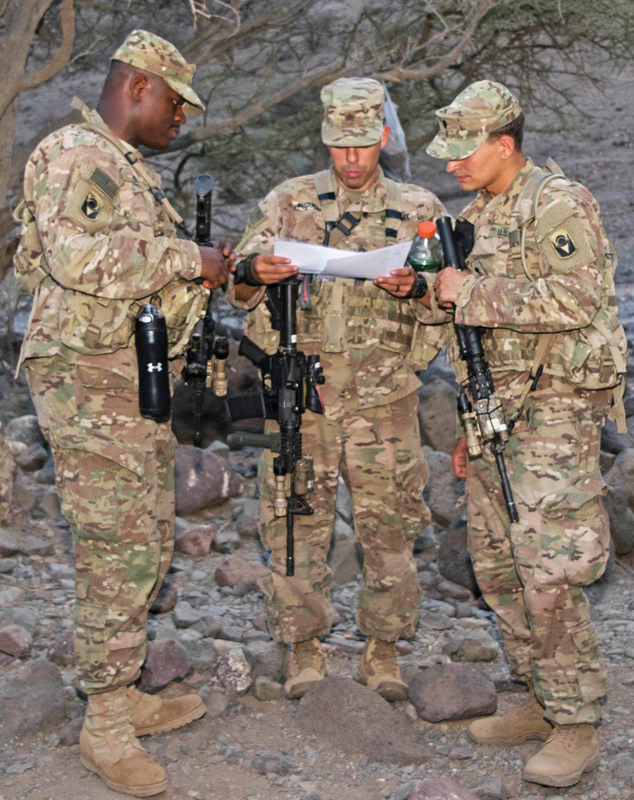 Nayib Cruz of the 124th Infantry Regiment in Djibouti. As the 22nd secretary of the U.S. Army, I am committed to a future Army where every rank and specialty can draw from among America’s best; where our soldiers represent states and cities across this country and members of its diverse communities. I see a force where soldiers are enabled by another great source for our nation’s strength: our marketplace of ideas and innovation, where soldiers are supported by an acquisitions process that more closely reflects the adaptability of America’s industrial base, equipping our men and women with what they need, when they need it. I see a force in which soldiers of various religious backgrounds are provided appropriate accommodations and have the liberty to follow their faith traditions as members of our military family. I see an Army where we care for soldiers’ physical and mental health, as well as that of their family members, with the same determination we bring to warfighting, giving our men and women the peace of mind they need to focus on their missions as they confront emerging threats and defend our nation around the world. For the Army of tomorrow to remain as great as the Army of today, we must live up to our own legacy, continually challenging ourselves to attract the best and to bring out the best in each other as members of strong, diverse and creative teams. Just as Carney of the 54th Massachusetts picked up the colors from those who went before him, we must carry the banner forward today to become an Army that is stronger, more adaptable and more effective in achieving our missions and meeting our responsibilities to the American people. 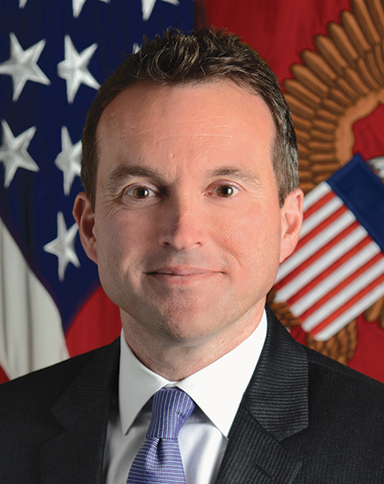 Eric K. Fanning has been secretary of the Army since May. He previously served as acting secretary, acting undersecretary and chief management officer of the Army; chief of staff to Secretary of Defense Ash Carter; undersecretary and chief management officer and acting secretary of the Air Force; deputy undersecretary of the Navy/deputy chief management officer; and deputy director of the Commission on the Prevention of Weapons of Mass Destruction Proliferation and Terrorism.